American college student Otto Warmbier, who returned to the United States last week after 17 months of detainment in North Korea, has died, his family announced Monday. Warmbier, a University of Virginia undergraduate student, returned to the U.S. in a comatose state after North Korea released him for medical reasons on Tuesday. It is unclear how Warmbier ended up in such condition, but North Korea has blamed it on botulism. Doctors in the U.S. treating Warmbier said that reasoning did not make sense. Warmbier's parents released a statement on their son's death. "It is our sad duty to report that our son, Otto Warmbier, has completed his journey home," the statement read. "Surrounded by his loving family, Otto died today at 2:20 p.m."
The Warmbiers thanked those who assisted in their son's care back home in Cincinnati, Ohio, and condemned the North Korean regime. "We would like to thank the wonderful professionals at the University of Cincinnati Medical Center who did everything they could for Otto," the statement said. "Unfortunately, the awful torturous mistreatment our son received at the hands of the North Koreans ensured that no other outcome was possible beyond the sad one we experienced today." Last week, Warmbier's father and doctors held press conferences on Otto's captivity, release, and medical condition. North Korea's highest court sentenced Otto Warmbier to 15 years in prison with hard labor for subversion after he gave a tearful confession in March 2016. 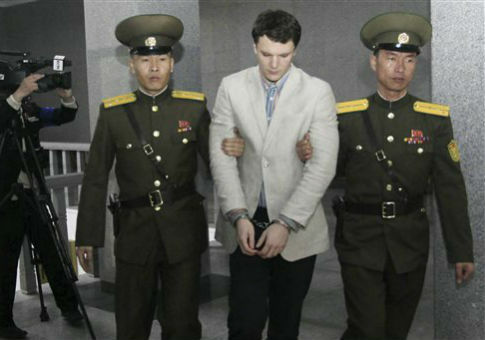 Warmbier was visiting North Korea last year when he was arrested for taking a propaganda poster from his hotel before attempting to leave the country. He was then arrested by North Korean authorities. This entry was posted in National Security and tagged North Korea. Bookmark the permalink.